“I am going to show evidence and testimony. Our people want justice against terrorism. Justice,” Maduro said concluding his statement. 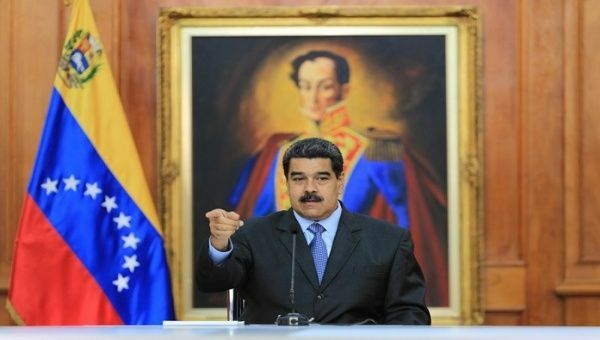 August 7 (teleSUR) Venezuelan President Nicolás Maduro presented forceful evidence incriminating the government of Colombia in the failed assassination perpetrated against him on Saturday in the capital Caracas. “I inform the people of Venezuela that we continue to work on the investigations into assassination attempt in a degree of frustration, and in the next few hours I will be presenting strong evidence of the links that the Colombian oligarchy has with the events on Avenida Bolivar,” the president had previously said in a video posted on his official Twitter account early Tuesday. Also, the president said that the executors of the plan received training in the city of Chinacotá, department of Santander in Colombian territory. “It is clear and there is sufficient proof of the participation of the Colombian government of the outgoing Juan Manuel Santos. We have the location, the names of the place in Chinacota Norte de Santander where they trained, the assassins, the terrorists, all in the coming hours. In this regard, the Venezuelan head of state confirmed that all those involved in the terrorist act have already been captured. Minister for Internal Relations, Justice and Peace, Néstor Reverol noted that one of those involved has an arrest warrant for his involvement in the attack on Fort Paramacay base in 2017, while another was held in prison in connection to the 2014 violent anti-government protests known as guarimbas. -A drone was located in the business center Cipreses by the group number 2, referred to as “group BRAVO.” It was manipulated from the 10th floor by a terrorist group trained in the Colombian town of Chinacota, in the northern province of Santander. -The terrorists made preparatory observations ahead of the attempt on the July 24 parade in the state of Carabobo, yet did not eventually launch the attack then because of a lack of preparation, just as they eventually canceled on July 5 on the celebration of the Independence. -They were confirmed that the public event on Aug.4 would take place on Avenida Bolivar in the afternoon, instead of the Avenida Los Proceres, and brought a drone to this location —the one the military officials identified and technological teams neutralized. -They lifted the drone above all the structures of the Supreme Tribunal of Justice, but it was then disturbed in its trajectory by technological equipment —used in order to inhibit signals. Meanwhile, the first group activated the second drone. -They had planned to use two drones, one that would explode with a pentrite chemical component, while the second one was meant to draw the attention somewhere else by crashing against a building called Don Eduardo, exploding with a C4 component. -Maduro reported that he was immediately told there was an attack going on and tried to organize immediately the evacuation in a bid to preserve the security of the crowd. -Identified terrorists include: Rayder Russo, resident of Colombia, and Osman Delgado, resident of the United States. -More raids are being carried out in order to arrest other groups involved in the consummation of the attack. -The masterminds of the attack are people who participated in the 2017 violent demonstrations in Venezuela. -The people involved in the attack were offered US50 million and residency in the United States.